The first moments of interaction between a service provider and a person seeking care for a mental health condition can set the tone and course of treatment. This first interaction can start a journey to recovery and a satisfying life—or it can leave a person unsure or even hopeless about their future and unwilling to go back a second time. The same is true about interactions with others in the community; a person who has been told that people with mental illness are scary, weak or unable to care for themselves may not seek help or may avoid telling others the full extent of what they are experiencing. This story of lost opportunity for engagement is far from an isolated experience. NAMI hears such stories repeatedly—and they often end with tragic consequences. Such stories illustrate the need for a shift in the culture of our country's mental health system. Recovery is possible and achieved by many, but for countless others, a mental health diagnosis leads to needless trauma, losses and shortened lives. When the mental health system fails to engage people early and treat them with dignity and respect, too many people leave school, lose jobs, get arrested, become homeless or attempt suicide. While there are many reasons people do not engage in mental health services and supports, including in some cases lack of insight, this report focuses on the foundation: the relationships between people with mental illness and service providers, families and the broader community. Trusting and respectful relationships are the basis for recovery. The systemic indifference of the mental health system would not be tolerated in the treatment of other conditions; people with other serious illnesses are treated with respect and care. They and their families are supported in care and recovery. Many people with mental illness are handcuffed during psychiatric crises, discharged to parking lots, jailed, turned away from services and left to live on the streets. Many never experience what should be the most basic standard of care in the mental health system: a healing connection with a mental health professional, dignity, respect and a sense of hope. The U.S. mental health system needs to promote more effective engagement. As the stories in this report indicate, effective engagement should be the foundation of mental health services, not merely an aspiration. There is an assumption that mental health treatment is good. Are we asking people to engage in bad mental health treatment? 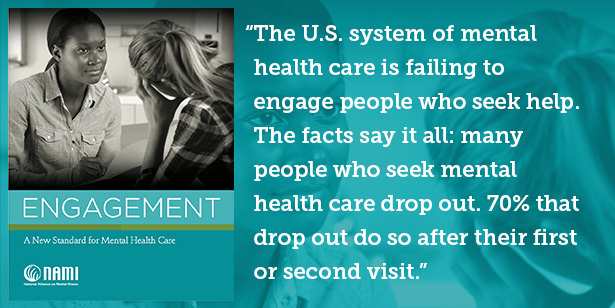 Make successful engagement a priority at every level of the mental health care system. Train for it. Pay for it. Support it. Measure it. Communicate hope. For those who feel hopeless, hold hope for them until they experience it themselves. Share information and decision-making. Support individuals as active participants in their care. Treat people with respect and dignity. Look beyond the person’s condition to see the whole person. Use a strengths-based approach to assessment and services. Recognize the strengths and inner resources of individuals and families. Shape services and supports around life goals and interests. A person’s sense of wellness and connection may be more vital than reducing symptoms. Take risks and be adaptable to meet individuals where they are. Provide opportunities for individuals to include family and other close supporters as essential partners in their recovery. Recognize the role of community, culture, faith, sexual orientation and gender identity, age, language and economic status in recovery. Provide robust, meaningful peer and family involvement in system design, clinical care and provider education and training. Add peer support services for individuals and families as an essential element of mental health care. Promote collaboration among a wide range of systems and providers, including primary care, emergency services, law enforcement, housing providers and others. I have seen the magic that happens when people can talk openly and deeply with a peer supporter while they are in the hospital. Including natural supports (e.g., supportive family and friends). Training should be culturally sensitive and competent to effectively meet the needs of individuals and families in diverse communities. Training on engagement for health care and mental health professionals. The experiences of individuals and families receiving mental health services and supports. Retention and dropout rates for individuals receiving mental health care, with a focus on achieving life and recovery goals. The culture shift embodied in the steps and principles above may appear simple and intuitive, but it has significant implications. Adopting a culture of engagement requires a reorientation of how we provide and pay for mental health services. Moreover, it requires a fundamental change in how we view mental illness and people who live with mental health conditions. This culture shift is essential to promoting connection to care and the hope of recovery for Americans who live with mental health conditions—from those who are experiencing first symptoms to those who have struggled with severe and complex conditions for decades. Appendix B includes promising engagement practices and programs. They offer hope and shining examples of the impact of effective engagement. As we create a new standard for mental health care, effective engagement should transcend specialty programs and exist wherever individuals access mental health services and supports. We need to speak a powerful message that reaches into the darkness and lets people know what is happening in the light. People need to see the tangible thing that is recovery. Engagement (\in-ˈgāj-mənt) is the strengths-based process through which individuals with mental health conditions form a healing connection with people that support their recovery and wellness within the context of family, culture and community. Share when you or your family felt most engaged in mental health services and supports. Share when you or your family felt most disengaged in mental health services and supports. Remember to tag your entry with #EngageMe.